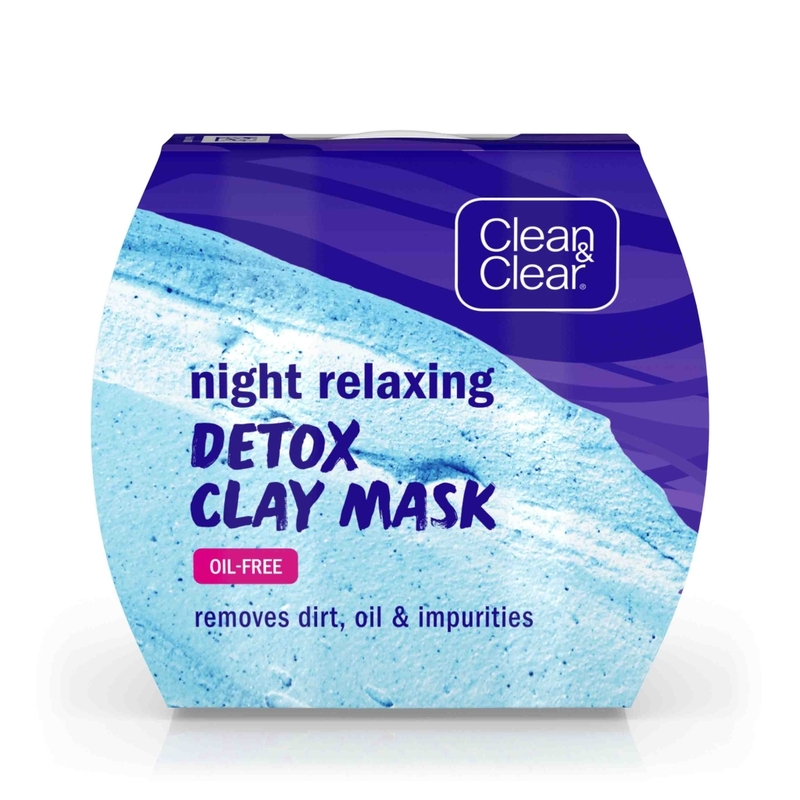 CLEAN & CLEAR NIGHT RELAXING® Detox Clay Mask detoxifies deep down to the pores to remove dirt, oil, and impurities from the day. Using the power of two mineral clays, bentonite and kaolin, with a relaxing fragrance, this specially designed formula gives your skin a detox before bed. Easy-to-use, this clay mask is gentle on skin and leaves skin feeling soft and healthy. Apply mask to face and leave on for 15 minutes while you wind down, then rinse thoroughly with water. The formula is dermatologist tested, non-comedogenic, oil-free, and won’t clog pores. I bought this and didn’t open it for months. I thought oh it was so cheap this can’t possibly work. Once I did try it I was stunned. The way it spreads. The smell is great. And better yet my skin is flawless when I wash it off. Thank you for creating this it has become my go to mask at night! Let me start by saying I was sceptical at first by all the great reviews I saw for this product. I was having trouble with breakouts and nose blackheads due to the large amount of oil that my face produces. (Pregnancy made it x5 worse.) Normally when I’m stressed I eat a lot of sugary food which makes my face break out more.This mask is like a reset button for my skin. I use it when my face Blackhead Eraser wash can’t clear up my face like normal. After using, my skin feels so soft and my blackheads are MUCH smaller. Any blemishes I have are smaller in appearance and less red. I probably use this product a few times a month. It is definitely a skin LIFESAVER! We're happy to hear you're using our products and seeing results! We'd love to learn more about your experiences. When you have a moment, give us a call at 1-877-754-6411. We're available Monday - Friday from 9:00AM to 5:30PM ET. When you speak to a product specialist, please mention your username so we can get connected to our conversation right away! We hope to talk soon! I bought this at my local Wal-Mart Supercenter in Tamarac for $3.00. Open reading the reviews here and opening. There was a huge finger dip inside the tub. Have not used it yet. Please be careful when purchasing this item especially at Wal-Mart! We're very sorry to hear about this and we'd like to learn more about the experience you've had with our product. Please give us a call at 1-877-754-6411, Monday - Friday from 9:00 AM to 5:30 PM ET. We look forward to talking to you! I never write reviews but I LOVE this product so much that I want to recommend it to everyone! I struggled so much with black heads on my forehead and I tried so many different things for blackheads but nothing worked. One day I randomly grabbed this product from the shelf at target and started using occasionally. I realized my skin was starting to clear up and I started using it more and more. Now my forehead is like completely clear of blackheads. It also helps with pimples anywhere on my face and I haven’t broken out as badly since I started using it. I now use it almost every night and it feels SO good on my skin. I’ve even been getting compliments on my skin from people and it’s crazy. I’m obsessed! I never usually breakout but lately I been extremely stressed with school. I came across this product in the store and gave it a try and all I have to say it WOW. Just from one wash and my skin was almost perfect again . This is definitely my go to night mask . Just amazing ! We're so sorry to hear this! We'd like to help. Please give us a call at 1-877-754-6411. We're available Monday through Friday, 9am to 5:30pm ET. We look forward to speaking with you! Purchased from Target today. I got home and opened it and it seems that it’s been used before. Super bummed about missing half the product. I went ahead and used it though and so far so good. I would have returned it but we don’t have a Target in town. Just be careful when purchasing. Double check it’s not been opened because the cardboard around it isn’t secure. However, I’m liking how it feels when it’s on and after. Just bummed I don’t have much left. We're so sorry to hear about this and we'd like to learn more about your experience. Please give us a call at 1-877-754-6411, Monday-Friday from 9:00AM-5:30PM ET. We look forward to chatting with you. Where did my pores go?! I struggle with large pores. They get clogged and no peel off mask has really done much for me. My teenage niece wanted me to try this. Wow!! My face is so smooth and my pores look so small. I've never found anything like it. For sure a regular now in my routine!